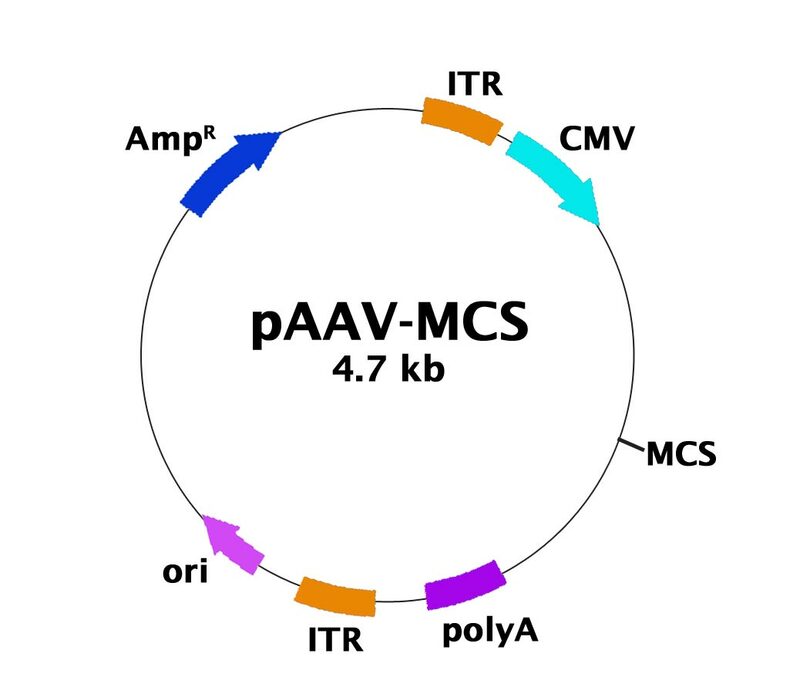 AAV CMV Expression Vector | Cell Biolabs, Inc.
Clone your gene of interest into this AAV Expression Vector, then co-transfect along with AAV packaging vectors into a packaging host cell line such as 293AAV. Hashimoto, H. et al. (2016). Study on AAV-mediated gene therapy for diabetes in humanized liver mouse to predict efficacy in humans. Biochem Biophys Res Commun. doi:10.1016/j.bbrc.2016.08.104. Zhao, T. et al. (2016). Compartment-dependent degradation of mutant huntingtin accounts for its preferential accumulation in neuronal processes. J Neurosci. 36:8317-8328. Nistal-Villan, E. et al. (2016). A versatile vector for in vivo monitoring of type I interferon induction and signaling. PLoS One. 11:e0152031. Gonzalez, S. et al. (2016). Blocking mitochondrial calcium release in Schwann cells prevents demyelinating neuropathies. J Clin Invest. doi:10.1172/JCI84505. Tang, F. L. et al. (2015). VPS35 deficiency or mutation causes dopaminergic neuronal loss by impairing mitochondrial fusion and function. Cell Rep. 12:1631-1643. Orabi, A. I. et al. (2015). Dynamic imaging of pancreatic NF-κB activation in live mice using AAV infusion and bioluminescence. J Biol Chem. doi:10.1074/jbc.M115.647933. Fyk-Kolodziej, B. et al. (2014). Marking Cells With Infrared Fluorescent Proteins to Preserve Photoresponsiveness in the Retina. Biotechniques. 57:245-253. Lutz, D. et al. (2014). Myelin Basic Protein Cleaves Cell Adhesion Molecule L1 and Promotes Neuritogenesis and Cell Survival. J Biol Chem. 289:13503-13518. Yan, S. et al. (2014). TDP-43 causes differential pathology in neuronal versus glial cells in the mouse brain. Hum Mol Genet. 23:2678-2693.